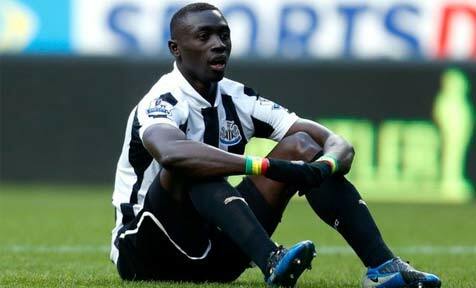 The Papiss Cisse Enigma – Low on Confidence or Class? After another dispiriting defeat at the weekend away to Fulham, Papiss Cisse has once again been the striker very much the focus of attention. A critical moment in the game with Fulham came when Luuk De Jong sent the 28-year-old Senegalese striker through one-on-one with keeper David Stockdale. Stockdale made a decent save, diving to the left to palm the ball away, but what was clearly evident was the lack of conviction Cisse showed in front of goal. It was the weak, unconvincing finish of a striker who has netted just one goal this season, and that from the penalty spot. “That moment decided the game. Normally Papiss would take that chance. That’s not like him,” added in support of his team mate. Unfortunately for Cisse though, it is very much like him and has been for some time based on his form over the past 12 months. It is almost inconceivable to imagine that this is the same player who, when he first burst onto the scene at Newcastle following his transfer to the club in the January transfer window of 2012, looked like being one of the clubs best ever signings. In 14 league games, Cisse netted 13 goals. An incredible return, yet it was not just the number of goals he scored but the quality of them. His 13th and final goal of the season was undoubtedly the best, the second in a 2-0 win over Chelsea, at Stamford Bridge, curled home from 35 yards with the outside of his right foot. A goal so good, it received the BBC’s Goal of the Season Award for 2011-12. The following season though was not quite so good. Again, Cisse netted 13 goals, but this time in all competitions across 47 games. It was a disappointing return for a player many had expected to be amongst the Premier League leading lights in 2012-13. Only 8 goals came in the Premier League from 36 games. If Cisse’s confidence was draining away in the 2012-13 season then this season it has evaporated completely. In 18 league games, he’s scored one penalty against Stoke City when the team were already romping to victory. He has netted single goals too in the FA Cup and League Cup, for a total of 3 goals in 21 appearances. According to acting first team manager John Carver, Cisse is certainly working hard enough in training but at the moment, the striker just does not look like scoring. As a result, his place in the team is now under threat. He’s already the second choice striker at the club; behind on loan Loic Remy. Speaking following the defeat at Fulham, Carver stated his belief that Cisse needs a scruffy goal or two to give him his confidence back. But are Cisse’s problems down solely to a lack of confidence, or is a lack of class at the highest level the real issue? When SC Freiburg received a fee purportedly of £9m from Newcastle for Cisse in 2012, it is fair to say there was a fair degree of bemusement in the Bundesliga over the move. The prescribed view in Germany was that Cisse was a decent striker, but no world-beater and was very much a form player, who was a useful striker when on form, but something of a liability when he was not. Newcastle and their fans have certainly seen both sides of the coin in Cisse’s two years at the club when he has gone from being one of the most exciting players in the Premier League, to looking like a player who couldn’t buy a goal. Yet that analysis of the Senegalese star does look a little harsh when you view his statistics over his career. In French football, in a career with FC Metz and loan spells at Chateauroux and Cherbourg, Cisse scored 53 goals in 147 games. At Freiburg, he netted 39 goals in 67 games in a three-year spell, including 22 goals in 32 Bundesliga games in the 2010-11 season. You do not score that many goals in the Bundesliga if you do not know your way to goal. Furthermore, he has made 29 appearances for Senegal and averages better than a goal every two games, having netted 15 times for his country. It certainly seems from the statistics that Cisse could be a far more potent threat for Newcastle and that given the right service, and a bit of luck, he can certainly score goals at this level. So the question must be asked, why isn’t he? Confidence is one issue and certainly Cisse is lacking that at present. It is a maxim of football that goals breed confidence in strikers and confidence breeds goals; which certainly explains why Cisse lacks both. Yet are the current Newcastle team set up to maximise his talents? Cisse certainly seems to be a player who thrives on opportunities breaking to him inside the penalty box. His finishes in the 2011/12 season when Newcastle beat Liverpool 2-0 were those of a penalty box predator. Nowadays though, too often Cisse is playing with his back to goal, moving into wider positions and all too often, running into offside positions. The current Newcastle set up doesn’t suit his talents, so he isn’t getting the chances to shine that he did in the past. That is not his fault. It’s not the greatest team management to sign a player with a set of specific strengths, and then ignore them to play a completely different way. At the moment Cisse seems to have hit a wall at Newcastle; the chances he does get he is now snatching at, he lacks conviction and belief that he will score, because he hasn’t been able to do so of late. No gifted penalty against an already beaten Stoke City will remedy that. Cisse can be a class act but for Newcastle to get the best from him requires a rethink of how the team will approach playing in the final third. Yet with Loic Remy looking a real livewire and certainly first choice at present, that possibility remains remote. That’s a shame as in Papiss Cisse, Newcastle United may have a potent attacking weapon, but are unwilling or unable to give it the bullets it needs to hit the target. 2 Comments on The Papiss Cisse Enigma – Low on Confidence or Class? He completely lacks class and ability. In his first season his goals were nothing but freak luck. If you look at all of them there wasn’t 1 where he showed composure and finished cleanly. They were all lucky swings of his boot which he was timing well because he was confident and in form. Now he isnt his complete lack of ability is showing, cannot control a ball properly, link up play is terrible, positional sense is terrible, finishing is terrible. When he has time to think about a shot it is usually unsuccesful. I do not want to see this man wear a Newcastle shirt again, we may aswell play young Adam Armstrong he certainly will not do any worse and may score goals given a chance. Declan – thanks for the comment on my article. At the time I thought we’d found a hidden gem but looking back I think what you say about his goals in the first season being freak is spot on. Many were just swing your boot and hope goals. Not sure about Adam Armstrong either tbh but I know what you’re saying about not doing any worse. Cisse actually seems like a pretty good guy who wants to do well for the team. Unfortunately I;m starting to feel his desire to succeed is now hindering his performance. He’s to desperate to score – highlighted by his reaction to the Palace goal. De Jong not looking a whole load better either. We need to keep Remy and strengthen over the summer.